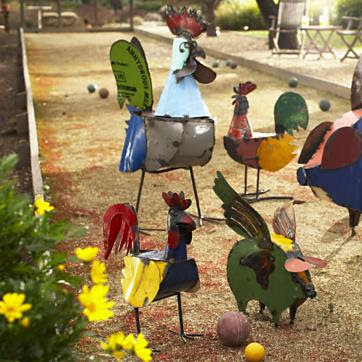 Smith & Hawken has some adorable tin roosters and pigs (with wings!) right now. Made from 100% reclaimed scrap metal. Pretty cute! They look a wee bit tipsy, like maybe they just went to a Mad Tea Party. :o) This picture is from the S&H catalog. Just so you know, this bevy o' chicks is not living at my house. But, if you want them at yours, you'll need to pay $259 for a big one, and $129 for the small one. Sqwaauuuk! Kate! Quick! 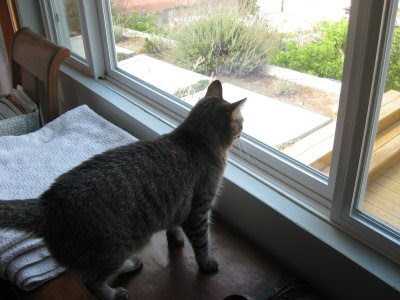 Run to the window! What is that I hear? Are people coming? Is the Mad Tea Party going to happen after all?? I hear they are happening all over the world today!! I know we're late, but we can probably whip something up quick. It's only our neighbor friends. They know we pretty much have one looooooooong, continuous Mad Tea Party over here every day! Do you hear that sound? 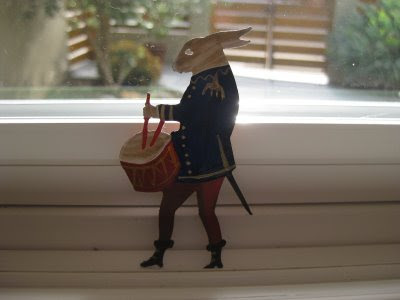 The sound of a rabbit thumping on his drum? Oh, it's Barnaby Thrumpington from Thrumpton Hall. And he's all decked out and looking quite dandy with his drum! It's so very LOUD!! And that looks like Mr. Bradford from around the corner! Oh, I love Ted Bradford. He always wears such cheerful colors. And that smile is constant! Yay! Kitty and Scotty are here! Oh, it's getting nuttier by the minute! Scotty looks hungry! And a wee bit dusty! Oh, amazing! 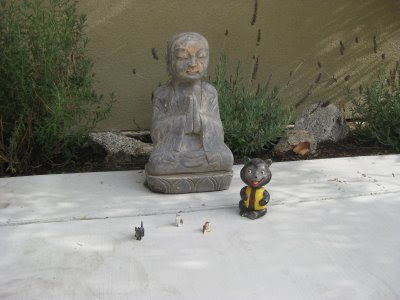 Never in a million years did I think the monk from the Shinto Temple would join us! What a distance he had to travel! I bet he's famished! Hmm? They all must have met at the front gate! 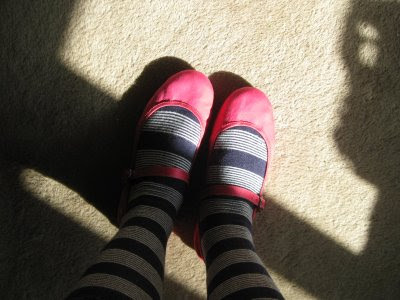 Oh, that Mad Hattress is donning her pink Mary Jane's and stripey socks. I'm thinking she should get in the kitchen and see what's cooking! Are these actual goodies, here in our dimension, or are they from another time entirely? If I bend the universe just a little, I think we can get them to our party for us! All of us! 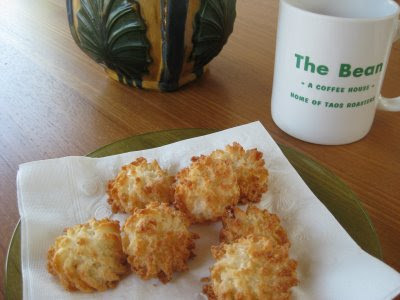 Sometimes at Mad Tea Parties we actually just serve coffee and coconut macaroons from the French Gourmet!!! 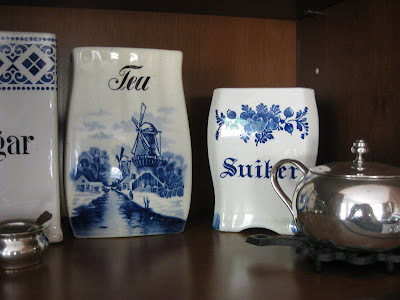 Oh, and now it's time to visit the other tea parties! Just start at A Fanciful Twist where they are all listed. I hope to see you again soon! James' Grandpa Paul was quite the bronze smith, always casting something: bullets or bowls, and even statues! 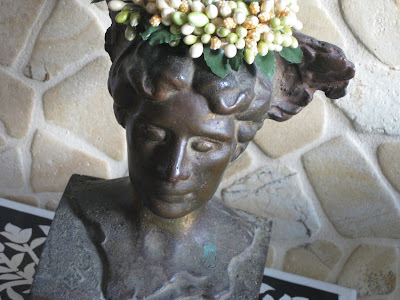 Among his works, a bronze bust of Nike! 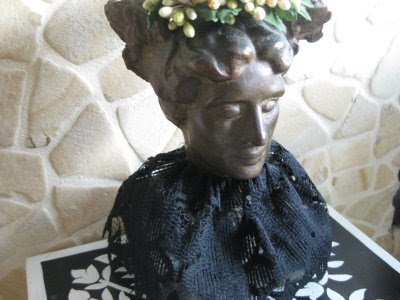 I am always dressing her up with various neck ribbons or hats. 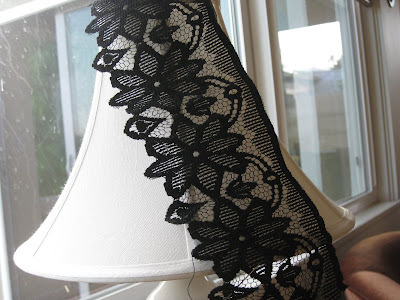 So, recently, I bought a collection of sewing items at an estate sale and wedged among the goodies was a shortish length of black lace. I'm forever buying these hodge-podge boxes or bags of stuff! I don't know why exactly, but when I come across these little sewing bundles that obviously belonged to whatever lady of the house that has passed on, I just feel like I have to have it - to preserve it, to continue using it. 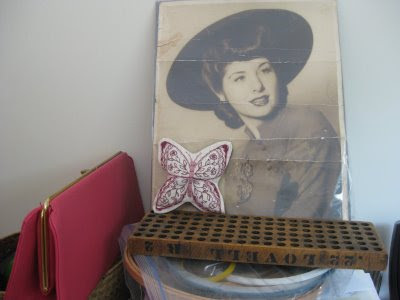 Maybe it's because when she was sewing, she was happy, and these items feel drenched in good energy. 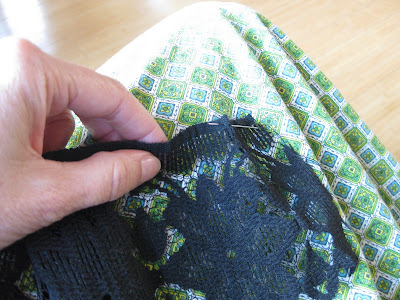 I can't imagine ever feeling the least bit mad when I sew. I kind of go into this dreamlike state, and I feel so peaceful and calm. 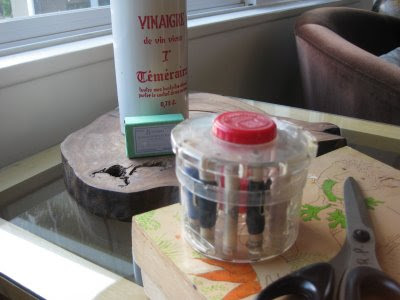 Also among the goodies, tucked beneath one thing or another was this nifty, German thread holder. Yesterday, June 15th, hubs and I celebrated 7 years married! We dated for a while, ahem, before we got married so we really have 11 years on the old tally sheet. We had a really nice day: lunch at Bloomingdale's, dinner at Hexagon, and a little afternoon nap in the middle of it all. A few friends even remembered our day with emails and calls, and our friend Sherri dropped off homemade chocolate chip cookies! So sweet in more ways than one! We bought a piece of furniture yesterday to mark the date. It's a piece we've been needing - a buffet! 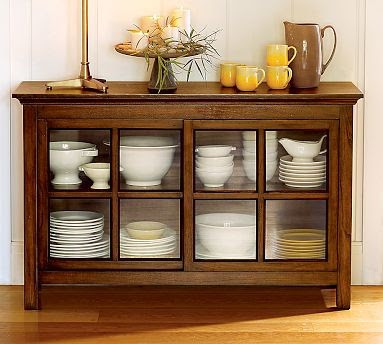 - and it will take the place of a bookshelf that I have been cramming full of estate sale finds. Hellooooo, Etsy! 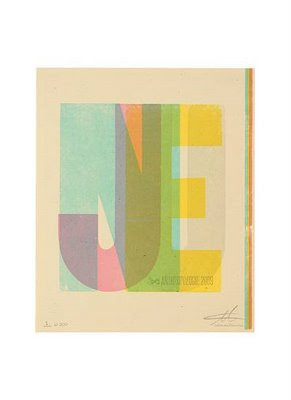 I also got a Hatch Show Print from Anthropologie as a remembrance - it says June, the month we were married. I had never really known about the Hatch Show print craze until recently, but it was an easy transition. It's way cool. Grovvilicious video about them and their shop and processes here. 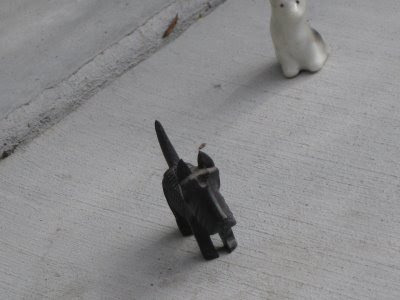 They even have cats in residence at the shop! Buuuwwwwaaaaaahhh-hhhaaaaaaaaaa (maniacal laugh). They are mine, all mine. I lusted after them for months, and then, while in San Francisco, found them ON SALE. I'm thinking they are not everyone's cup of tea considering the mustard-y color. But they sure are mine...gulp, gulp, gulpin' that tea. I love that they look vintage, but aren't. So I get the style, and none of the old lady's foot cells who owned them before I scrounged them from the bottom of her closet at a musty estate sale. And they are butter soft. Sometimes vintage shoes are hard, and my feet are not what they used to be in terms of toughness. As I've gotten older, I've developed Princess and the Pea feet. I've heard that as we age, the fat in the balls of our feet goes away to some degree; they lose that youthful plumpness. I have a theory that it travels north. On the 23rd of last month, we went (drove!) 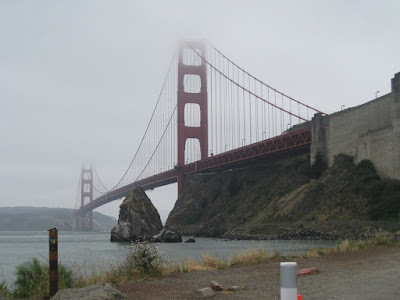 to San Francisco, then to Sonoma, to see our nephew graduate from Sonoma State University. We had a really fun time. 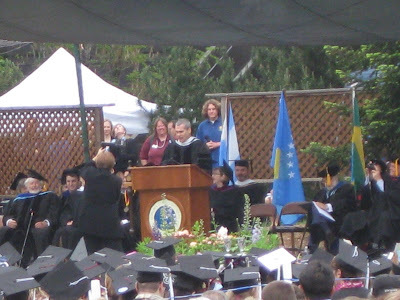 Henry Rollins gave the commencement address at the graduation; here he is in all his raging glory. The speech was actually quite subdued, for him, and motivating. And, it was absolutely FREEZING. Like..."I'm not sure I've ever been that cold" freezing. We were expecting 82 degrees, and it was in the low 50s - or so it felt. The minute they called Casey's name, I dashed for the car. Brrrrrrrrrr! I felt bad about leaving, but I was more concerned about losing toes from frost bite! I took this picture in the city. 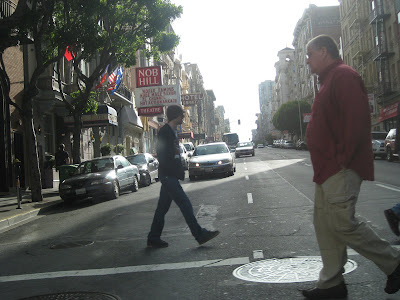 I love the bustling streets in San Fran. People hurrying to get where they are going. Not hurrying like New Yorkers though...more laid back. One of the highlights for me was the trip to Bell'Occhio. Mary and I spent close to 2 hours in the little shop. But, it is so rich with wonderful things that time just flies. The time I've spent at Bell'Occhio is some of my most treasured! It's like no place on earth. What is it about Restoration Hardware's design department? Are they looking into my head somehow? 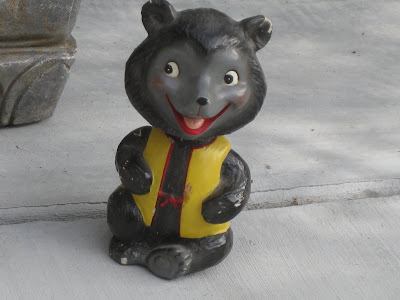 Do they have some secret Soviet spy device that reads my every thought? Here's yet another item from there that I would love to have -- the Mayfair Steamer Chest. 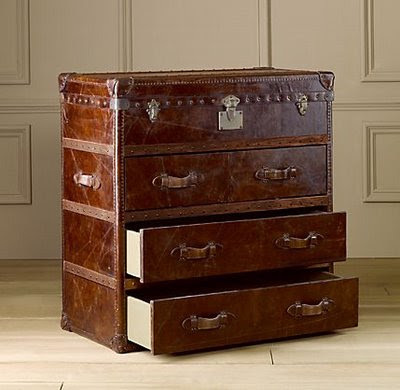 Sure, you could probably find an old trunk that would sort of resemble this, but how about a perfect, pristine one that smells good and has smoothly opening drawers into which you could put your clothes? Oh, it's beautiful, isn't it? Once again, you'll have to shell out a bundle to get this baby home. Oh, if only I'd taken a BEFORE picture. 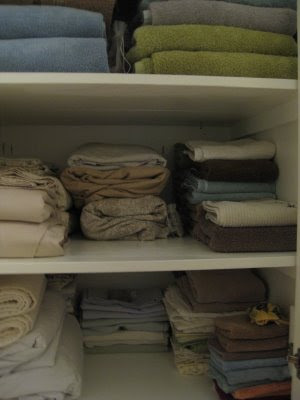 Just know that on any given shelf there was: sheets folded 10 different ways, towels of all sizes, pillow cases all willy-nilly away from their mates, blankets, sheets from the last bed before we got the king, and even a few dish cloths that didn't make it to the kitchen! But now, it's so much mo' bettah. 1. 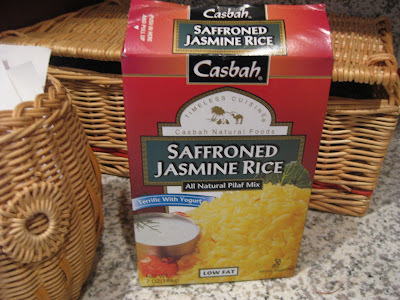 Cook a package of the Casbah saffron rice. This brand is so good; seems to have less sodium. This is the second food on my list of..."if they told you you could only eat one thing for the rest of your life, what would it be?" and I'd pick donuts first (even though I rarely eat them, but I love them that much). This rice would be second. It's so darn good and fluffy and saffron-y. 2. Heat a separate pan on medium heat and add a couple circles of olive oil in the bottom. Or, "EVOO" as Rachel Ray would say. 3. 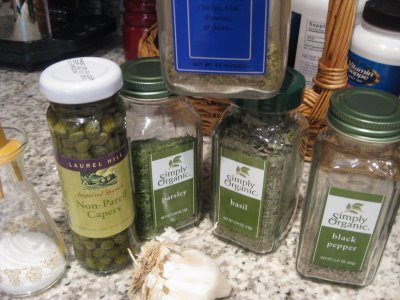 Add to the oil: a clove of garlic, chopped, and a pinch of each of these seasonings: salt and pepper, dried parsley, herbs de provence, and dried basil. Let the herbs bloom for a bit in the hot pan. 4. Add chopped up chicken (I used a breast and 2 thighs) to the oil and spices. As soon as you put the chicken in, you could douse it with a pinch more of salt and pepper, to taste, if you want. 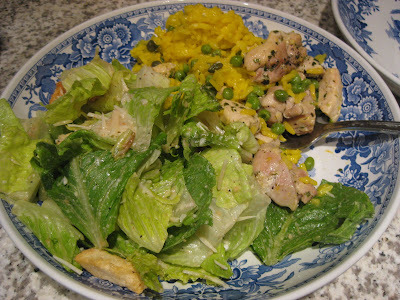 When the chicken is almost done, add half of the bag of frozen peas on top and two tablespoons of capers (drained). Once the peas have thawed and are heated through you are essentially done. 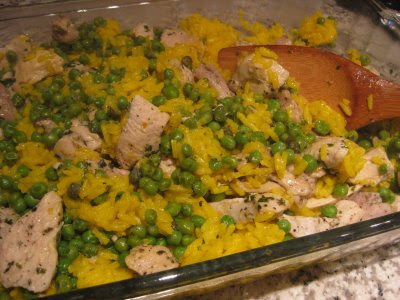 Just put the rice in a big flat dish or bowl and pour the chicken mixture on top and mix it all up. I also squeeze a half of a lemon on top for added flavor. Of course, if you can make a little salad to go with it, you truly have outdone yourself, right? Ha! Notice my big honkin' bowl here.